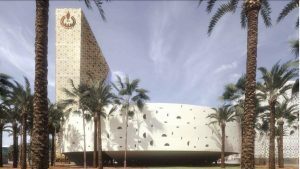 The NOC plans to construct a new complex in Benghazi (NOC). Libya’s National Oil Corporation (NOC) has announced that it has signed an agreement with the French-Italian Artelia Group for the management of the new NOC premises in Benghazi. The NOC did not reveal how much the project will cost. It stated that work would begin ‘‘upon completion of the preliminary financial guarantee and tax authority procedures”, and added that the project will be ”financed by lending from commercial banks”. The NOC said that the agreement was signed by NOC chairman Mustafa Sanalla and Artelia executive director Alberto Romeo in Milan on Friday 30 March. The NOC said the project is ‘‘an ambitious development plan for Benghazi, including local offices for NOC, further oil companies and governmental departments, as well as a hotel and conference complex, to launch this landmark development for Benghazi, proactively building a brighter and more confident future for the whole country’’. in describing the new development, the NOC said that the centre-piece of this development will be the stunning 100m tall “vertical blade” NOC local offices, clad in an iridescent and shimmering metallic gold. Also included in the harbour-side site will be the double hexagonal headquarters of Brega Petroleum Marketing Company, offices for Central Bank of Libya, a hotel and helipad, plus offices for further oil companies and an international conference centre. It added that the project will play a big part in the development of the harbour area and grow the reputation of the city. Moreover, the NOC said that it expected that the project will be the first in the Mediterranean area to obtain a Leadership in Energy and Environmental Neighbourhood Development sustainability rating – the most widely used environmental building rating system in the world. it is worth noting that the issue of the NOC’s premises in Benghazi is a politically sensitive one, with locals demanding that the NOC’s headquarters, transferred to Tripoli by Qaddafi, be returned to their original location in Benghazi. The fact that over two-thirds of Libya’s oil production is produced in the east adds credence to this demand.